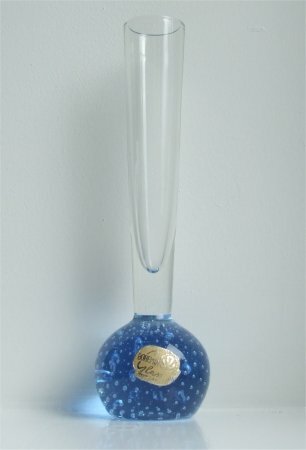 This blue vase is approximately 154mm (6") tall. 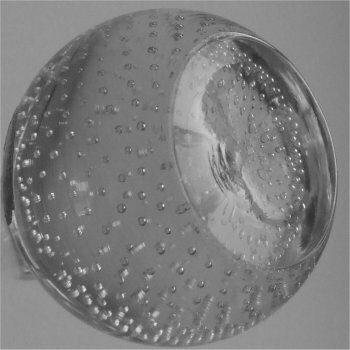 The base is round and has small evenly spaced bubbles that come up from the bottom following the curve of the ball. 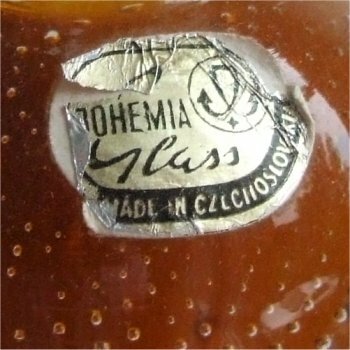 It has a slightly concave bottom, which can be seen on the close up image of the label. The stem has a medium flare being approximately 24mm (15/16ths of an inch) in diameter. 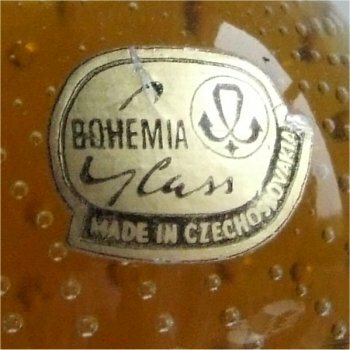 The label is a buff yellow colour with the wording: 'BOHEMIA Glass, MADE IN CZECHOSLOVAKIA' in metalic gold lettering. 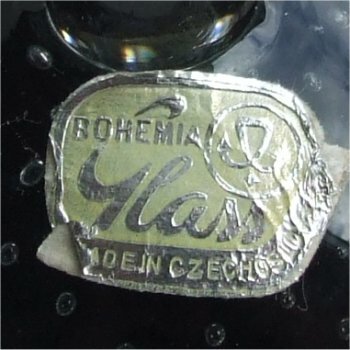 In 1965 all crystal manufacturers in the Czech republic merged. 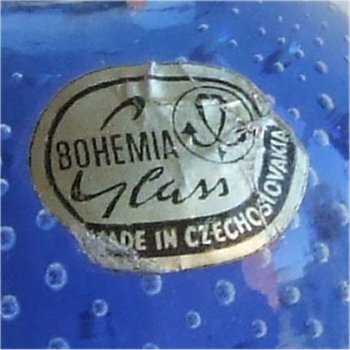 The glassworks were in Jihlava, Nizbor, Podebrady, Svetla nad Savazou and Zamecka. I have not identified which works this particular label came from, though it could possibly have been used by several or all of them. 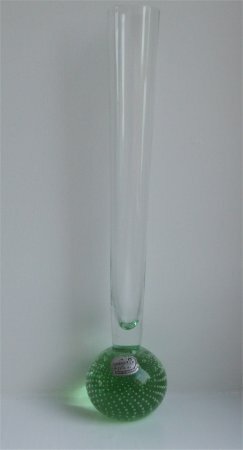 This soft lime green vase is approximately 230mm (9 & 1/16th") tall. The base is round and has small evenly spaced bubbles that come up from the bottom in a spiral. It has a slightly concave bottom. 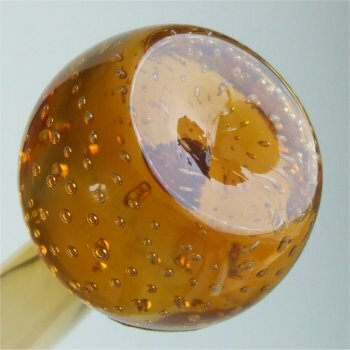 The stem has a medium flare being approximately 27mm (1 & 1/16th ") in diameter. 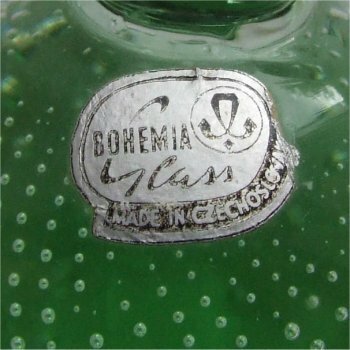 The label is a metalic silver colour has the wording: 'BOHEMIA Glass, MADE IN CZECHOSLOVAKIA' in black lettering. 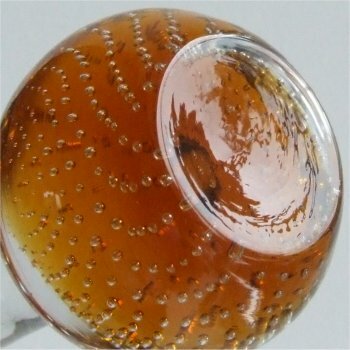 This amber vase is approximately 154mm (6") tall. The base is round and has small evenly spaced bubbles that come up from the bottom in a spiral. It has a slightly concave bottom. 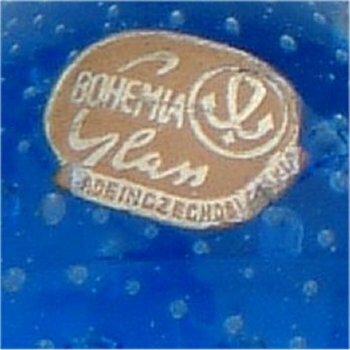 Unusually for a Czechoslovakian vase the stem is the same colour as the base and has a medium flare being approximately 25mm ( 1") in diameter. The label is the same as on the blue one. 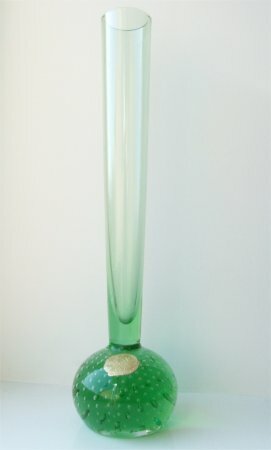 This green vase is approximately 226mm (8 & 7/8ths") tall. The base is round and has small evenly spaced bubbles that come up from the bottom in a spiral. It has a slightly concave bottom. 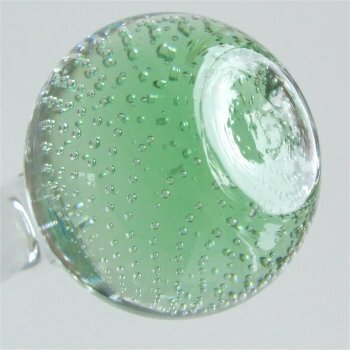 The stem is also the same colour as the base and has a medium flare being approximately 25mm ( 1") in diameter. 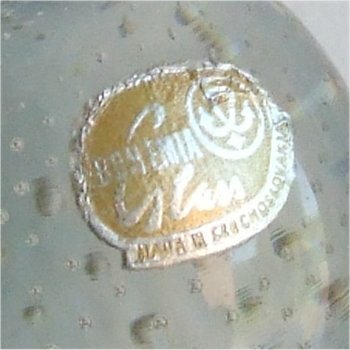 The label is gold with gold writing. 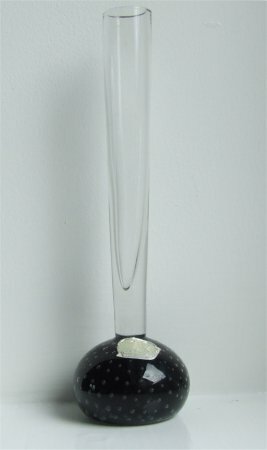 This grey vase is approximately 160mm (6 & 5/16ths") tall. 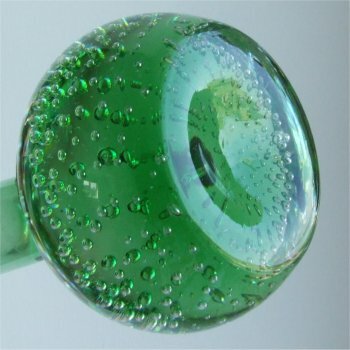 The base is a slightly flattened ball and has small evenly spaced bubbles that come up from the bottom in a spiral. It has a slightly concave bottom. The stem has a narrow flare being approximately 30mm (1 & 3/16ths ") in diameter. The label is the same as on the blue one. 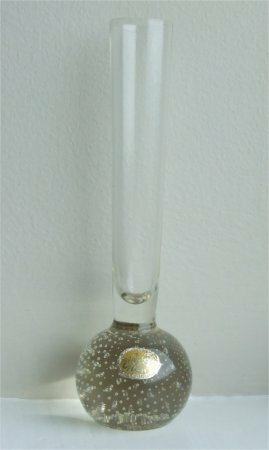 This clear vase is approximately 154mm (6") tall. 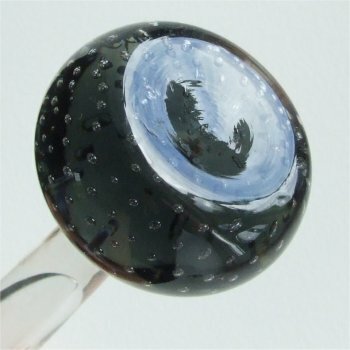 The base is a round ball and has small evenly spaced bubbles that come up from the bottom in a spiral. It has a slightly concave bottom. The stem has a narrow flare being approximately 24mm (15/16ths ") in diameter. 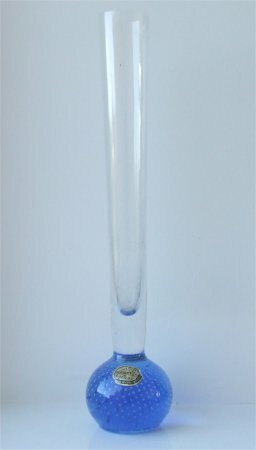 This blue vase is approximately 230mm (9") tall. 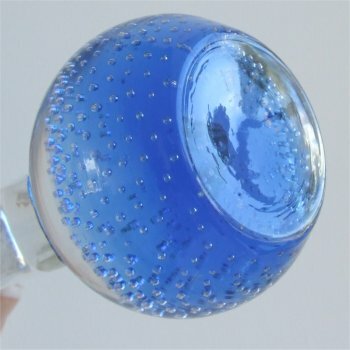 The base is a round ball and has small evenly spaced bubbles that come up from the bottom in a spiral. It has a slightly concave bottom. 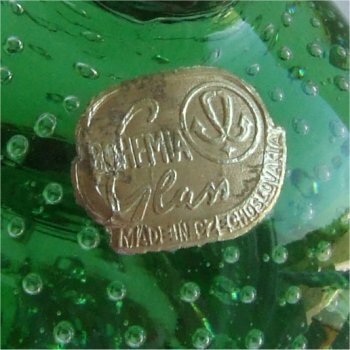 The stem has a medium flare being approximately 28mm (1 & 1/8th ") in diameter. 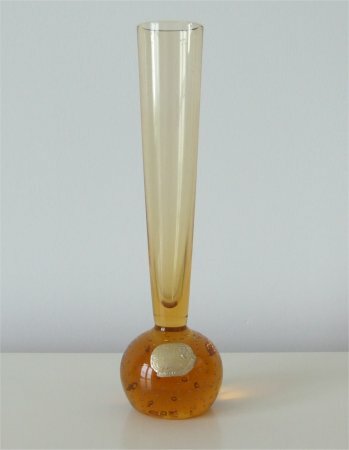 This yellow/amber vase is approximately 193mm (7 & 1/2") tall. 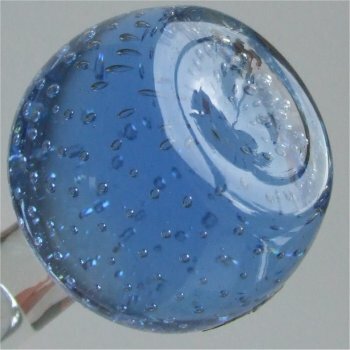 The base is a round ball and has small evenly spaced bubbles that come up from the bottom in a spiral. It has a slightly concave bottom. The stem has a medium flare being approximately 25mm (1") in diameter. 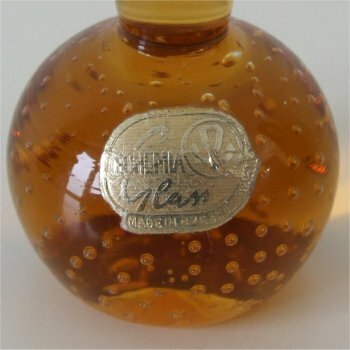 This orange/amber vase is approximately 230mm (9") tall. 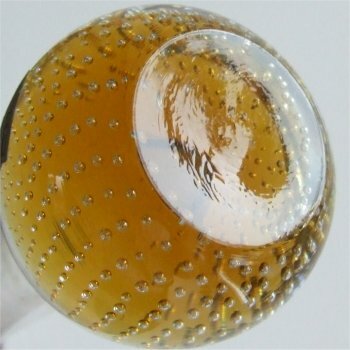 The base is a round ball and has small evenly spaced bubbles that come up from the bottom in a spiral. It has a slightly concave bottom. The stem has a medium flare being approximately 27mm (1 & 1/16th ") in diameter.